Hi Guys, Does anyone know much about these? I picked up a couple of cases of old shop stock and these guys were in there! They are extremely cool looking! I think they are 1980's? Any info appreciated. The pictures on the shop display boxes are class! 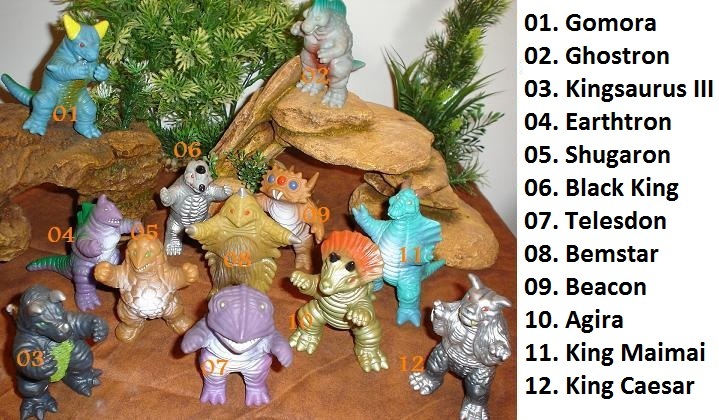 These figures were also known as Super Dino Monsters and there's a thread with extensive discussion and research from several years ago on our very forum, in the ID section. These are the monsters upon which all the sculpts appear to be based. Some resemblances are more loose than others. All of these monsters originate from the Ultraman franchise with the exception of #12, which despite repeated searches I've only been able to conclude is based on King Caesar from Godzilla. None of these toys appear to be bootlegged from existing Ultraman toys, unlike the other companion line of these figures which uses slight modifications of Bandai 6" vinyls. If you got more than the one box, I would be interested in some, man. What's the size of them? I want to say four or five inches tall. If you've ever seen the Definitely Dinosaurs vinyl figures (not the action figures with the cavemen) from years back, they basically are the same size and style of toy. Hi Guys, just catching up on these responses. Thanks so much for the info. Yeah they are approx 4-5" inches tall..... I do have a couple of boxes left, sold 3 sets tonight already. Keeping a set for myself obviously so grab what's left if interested. I have the King Caesar one... would love a set. Put up a sale thread with pricing when you're ready. Priced right, I'm sure they'll move. Some of my favourite toys ever, love them! WANT/NEED! Warmonger (from Mighty Max's Skull Mountain), will trade for Alien Magic! Happened before I ever posted my first reply, and I initially missed it too. Yeah, I caught that, when he pointed it out to me haha! I was trying to catch up around here.... guess I didn't do a very thorough job?